OxygenOS heralded a new direction for OnePlus. The company's in-house OS came pre-installed on the OnePlus 2 and OnePlus X, while Cyanogen OS remains the default OS on the OnePlus One. Both are based on Android Lollipop, but many people remain confused about the differences between the two, and which one is better. Read on for our comparison of the parties controlling OnePlus smartphones. Why did OnePlus and Cyanogen split up? On the face of things, OnePlus's desire to have its own in-house operating system makes sense, in terms of ensuring that the OS integrates smoothly into the OnePlus hardware, delivering faster updates, and so on. Yet overshadowing this PR-friendly story is a bitter dispute between Cyanogen and OnePlus, which is more likely to be the reason behind their split. A key part of the agreement between the two companies was that OnePlus had non-exclusive rights to ship Cyanogen with their devices worldwide. However, when OnePlus tried shipping devices to India last year, it turned out that Cyanogen had already made an agreement with Indian manufacturer Micromax that gave the company exclusive rights to the Indian market. This meant that the OnePlus One wasn't released in India with Cyanogen OS as planned, and OnePlus had to come up with an alternative operating system to run on the OnePlus One in that market. Suffice to say, OnePlus wasn't pleased, while Cyanogen defended its agreement with Micromax, stating that it didn't expect it to affect the agreement with OnePlus. Admittedly, a rather weak defence. And so, OxygenOS was born. It became OnePlus' stock OS for the OnePlus 2 and OnePlus X, and is now widely available for the OnePlus One. How do I get Cyanogen OS 12.1 and OxygenOS? Cyanogen OS 12.1 is now widely available as an OTA (over-the-air) update for the OnePlus One. Despite the well-publicized falling-out between the two companies, a Cyanogen spokeswoman told AndroidPIT that "there are no plans for changes as of right now. We are continuing to support OPO devices running Cyanogen OS." OxygenOS, on the other hand, needs to be installed manually on the OnePlus One. You can find it on the official OnePlus website. What's the difference between Cyanogen OS 12.1 and OxygenOS? At first glance, both operating systems look similar, staying fairly loyal to the stock Android Lollipop interface. But dig a little deeper, and the differences between the two start to show. Cyanogen OS 12 is all about customization, letting you tweak everything from the navigation buttons and battery icons, to the settings and status bar. It's also packed with hundreds of downloadable themes, which can make Cyanogen look like a completely different operating system within seconds. OxygenOS is a bit more 'stock', and isn't as customizable as Cyanogen. While it has a selection of Lollipop and OnePlus wallpapers, it's not designed to be tweaked as much as Cyanogen, so may be more suitable for casual users. It does have a Quick Settings menu, where you can rearrange the buttons however you please, which is a nice touch, but certainly won't be enough to satisfy the more tinkery OnePlus One owners out there. 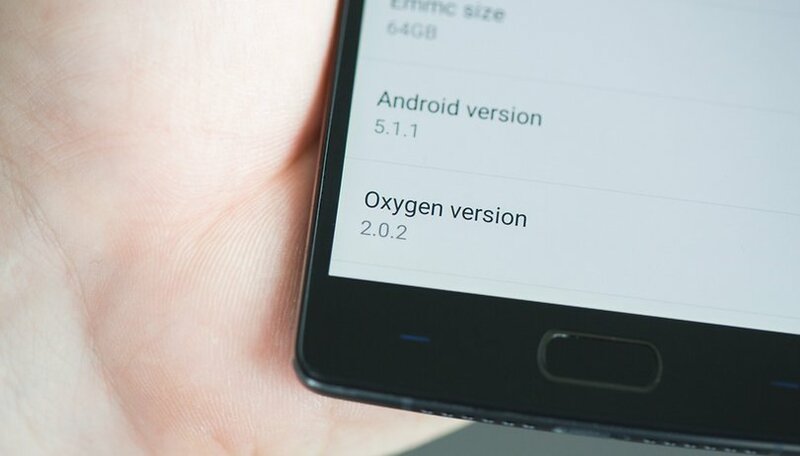 OxygenOS 2.0 brought additional options, such as support for custom icon packs and customizable color schemes, including Dark Mode, which was sadly removed from Android Marshmallow. These are all steps in the right direction, but OxygenOS still remains some distance behind Cyanogen. Cyanogen OS has some pretty powerful apps onboard, including Cyanogen Mail, the audio-enhancement app Audio Maxx, and its own camera app, which is capable of 4k recordings and RAW photos. OxygenOS has none of these features, though this is to be expected from a newcomer. Both of the operating systems come with the usual array of Google apps. We're still playing around with both Cyanogen OS 12.1 and OxygenOS, though at this point it seems as though the more established Cyanogen is the better option. It's more customizable, more feature-packed, and there is little that OxygenOS offers at this point that makes it seem worth the hassle of manual flashing. However, Oxygen is likely to improve with time, so we're prepared to give it some growing room, because it certainly appears to have a lot of potential. In the meantime, if you've tried both Cyanogen OS 12.1 and OxygenOS, let us know what you think about them in the comments. Which one's your favorite? I recently got the OPT coming from a OPO with Cyanogen 12.1. I had waaaaay better battery life on Cyanogen than Oxygen. It's really quite atrocius and I've taken steps to minimize the leech-ware and settings. I've rooted and am tentatively thinking about going back to Cyanogen if Oxygen doesn't recieve some much needed tweaking. Oxygen OS actually is a boon to the one plus fraternity. One plus phones have been constantly experiencing network failure or drop issues. The old cynogen 12.1 didnt help with this issue. the person whom you were talking to could hear constant disturbance. This is fixed in the oxygen OS. the new firmware updates released makes the device work perfectly. The code thread responsible for linking the mic was not that well written in cynogen 12.1 . As the oxygen is built by one plus itself, the hardware and software linking has been done exceptionally well. But the customization options were really hot in the cynogen, i agree! But if the basic function of a phone is void, rest of the features go moot! Mis issue is fixed in Oxygen OS? Please give me idea, how can I fix mic issue. My friends could not able to hear me properly. If I use headphones or speaker then it works fine. Exactly. Totally agree! Had too many issues with CM like screen going dark during incoming call or unresponsive screen randomly or people not being able to hear you unless you're on loud speaker or Bluetooth. OxygenOs is boring (plain Jane) but very functional. See my first reply. Turning off 'OK Google' from any screen fixes the mic issue. The mic issue in Cyanogen is caused by 'OK Google' detection enabled from any screen. Turning this off fixed the mic issue. I like Cyanogen OS than Oxygen. Customisable interface and innovative features from the open source community. I just used the Oxygen OS on my friend's Onyx for a while. Its not that good.! He was exploring to port Cyanogen on it. I use a Oneplus X. The stick oxygen os which comes pre installed is butter smooth without any flaws or hiccups. The dark mode is the best feature and also the of screen gestures. But I prefer the customizability of cm and the reduced ram consumption is also something I was used to in Cm. I've used the OnePlus One with Cyanogen and the OnePlus 2 with Oxygen and I personally prefer Cyanogen due to the customization options that are available. In oxygen, google dialer is implemented. Hey does i have to install Cm12 os in One Plus One,manually or i get automatically update for it? M using CM 12.1 Nightly build running on Android 5.1.1 and I find it really smooth and stable.....far more than Android 5.0. Oxygen OS is the new kid on the block so not much to expect but I hope they improve the OS so that it could atleast give some competition to CM. You can buy em with out a invite for soms time now. And even with the invites i was able to get one in 3 weeks time. You just had to ask nicely not "zomg wants thatz fhones. Gives invitez !!!!!!" And they said 50 dollar more per new one plus. Which is still Bloody cheap compared to the rest. Gawd you can't read can you? Cyanogen had a preexisting agreement with Micromax that they didn't expect would conflict. They didn't purposely hurt OPO.